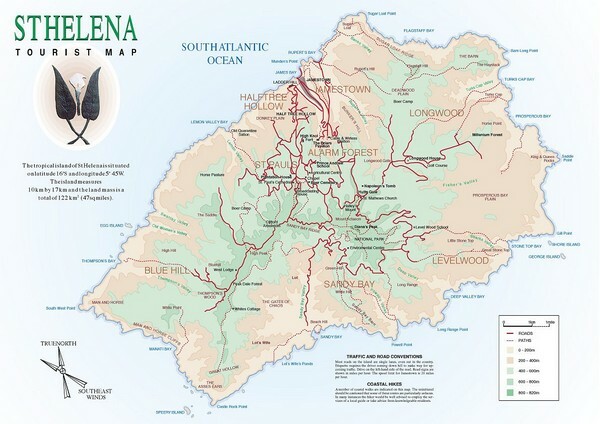 Tourist map of the remote island of St. Helena. Shows details of key locations, routes and elevations. 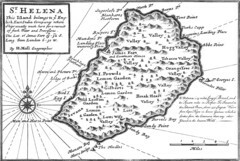 St Helena is situated in the South Atlantic Ocean, 1,200 miles (1,950km) from the south-west coast of Africa, and 1,800 miles (2,900km) from the coast of South America. 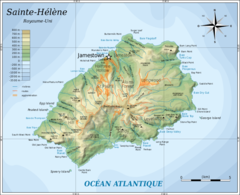 The nearest land is Ascension Island, which lies 703 miles (1,125km) to the north-west. 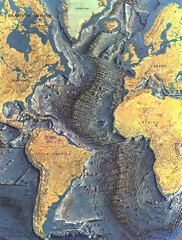 The Island is 47 square miles (122 square km), ten and a half miles (17km) long and six and a half miles (10km) wide.